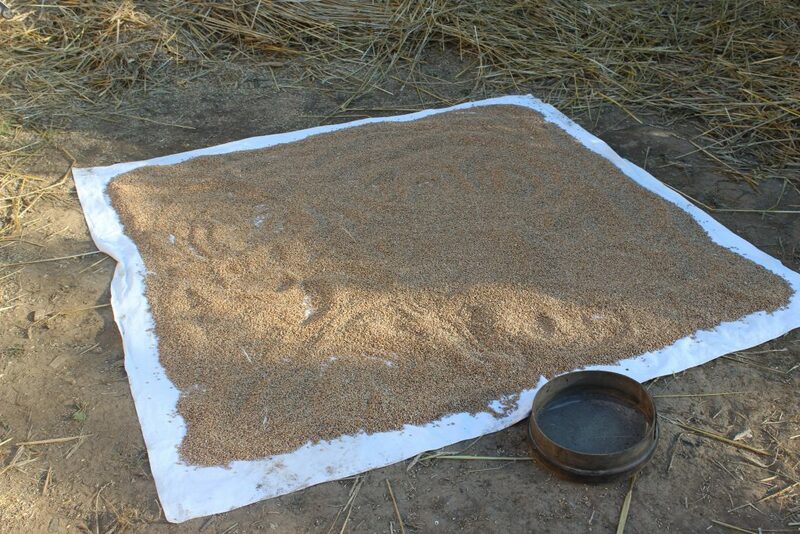 After threshing, wheat grains are spread out on a sheet to dry in the sun, before being bagged away. The basic principals of cereal growing are quite simple: select the seed, sow it in well-prepared ground, harvest it, thresh it, winnow it, and grind it – and you have flour from which you can make your own bread. In practice, things are a little more complicated, mainly because farming works best as a communal activity rather than as an individual enterprise. The first difficulty is the selection of the seed. Over the course of time, farmers have selected varieties suited to every different locality, and have been able to share their seed grain with each other, so that it has been preserved through good times and bad times. The benefits of this work – which took place over thousands of years – have largely been lost. The world’s agro-industry now has an active agenda to try to stop people growing local varieties, and to rely instead on freshly-generated varieties that instead of being adapted to local conditions, are designed to respond to inorganic fertilisers, agricultural chemicals, and large-scale agricultural equipment.